You can get your message out to the public in a manner that grabs their attention and familiarizes them with your business on banners. This is a great way for you to introduce yourself to the community in an affordable and effective manner. Banners can be displayed both indoors and outdoors without much concern over weather conditions. Whether you decide to display indoor banners or outdoor banners, the banner installation process is extremely simple. They are versatile and you have the ability to display them in a manner which works best for your needs. Banner installation can be done so they display vertically or horizontally, as well as hanging or be portrayed in stands. Indoor banners will help you attract new customers and increase your sales without much added effort on your part and with minimal expense. Each and every day banners are seen and reacted upon countless times. They will help you to create brand awareness, advertise specials, promote up and coming events, and draw new customers into your shop, booth, or business location. The banner installation process for outdoor banners is much simpler than many think. These banners will draw immediate attention to your business and help your name to stick in their mind. One of the great things about outdoor banners is they can call attention to your business from a great distance and this means you can get new customers who may not have learned of your business any other way. Outdoor banners are designed in a manner which allows them to withstand a good amount of harsh weather conditions. Custom indoor banners and outdoor banners allow you to display your logo in a large manner. You can also include the message you want to get out to potential customers. You will be able to choose from a variety of styles, shapes, sizes, colors and designs. 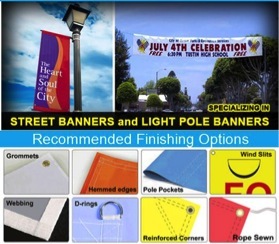 This gives you the ability to display banners that get the message out to the public in the manner you want. You can go simple with a polyester pennant string or you can go big with a large banner with a huge logo or message. Either way, the banner installation process is simple and your message will be seen by many. When you get a custom banner you will begin to see fantastic results as new customers take notice and begin to act upon the attention your banner is causing. When you are looking for indoor banners and outdoor banners, you want to go with a company you can count on to get your message across. This is why you should contact The Sign Studio where you will receive excellent service from Julie, Bill, and Chris. This team is dedicated to offering indoor banners and outdoor banners that help companies to grow their customer base and get their name out there. You will quickly see what it is that has made the team at The Sign Studio the obvious choice for so many and a great choice for your banner needs. They help you with everything from the beginning stages of designing your banner to banner installation. They do this all while being more than helpful and going that extra mile to make sure you are pleased. What is the difference between ADAAG and Ca Braille – Grade 1 & Grade 2 Braille? Braille allows blind people to read. They run their fingers across a surface of raised dots arranged in cells. Braille is a phonetic code rather than a traditional alphabet. Created in the early 1800's by Louis Braille, blinded in childhood, who had a passion for learning and few books available. His invention opened a world of communication and self-reliance for the vision impaired. A cell is three dots high and two dots wide. The dots are nubs that protrude from a differentiated background. Text reads left to right. Beyond this, things get a little complicated for the sighted person. Over time, subsets of Braille have developed for mathematics, music, science, and literature. Advanced systems include contractions and shortcuts. But, because reading Braille in book formats takes time, many blind people prefer audio recordings. Still, when it comes to signs, Braille plays a significant role. Braille 1 positions dots to represent twenty-six letters and some punctuation marks. There is no upper or lower case letters, and there are no numbers. It is the system most readers learn at the very beginning, but they move onto Braille 2 quickly. By 1905, Braille had moved away from a transcription from the French alphabet to an arrangement of dots. The need to speed the reading process and diversify the languages available, they introduced contractions, abbreviations, and logogram symbols. In effect, they created a new language. Instead of cells representing one letter, one cell might represent a shortened word. A cell combination might be a double letter combination of common words that leaves out the vowels. Or, it might contract common prefixes or suffixes. In any case, the system has evolved into a complex of rules, usage, and vocabulary. Like other government agency guidelines, the rules a complicated. The guidelines determine the typeface, color, and size. It requires Braille Grade 2 but allows some pictograms and logograms. California's regulatory history has always tweaked federal regulation a little tighter. So, it has stepped up the required guidelines for Braille in public signage. It wants the signs that direct and inform in the same locations throughout facilities, but it narrows the specifications. Dots must be rounded or domed. Dots will be 1/10 inch (2.54 mm) on center in each cell. Cells will be 2/10 inch (5.08 mm) from the second column of dots to the first column of dots in adjacent cells. Dots will rise at least 1/40 inch (0.635 mm) from the background. The Sign Studio knows the differences when it comes to Braille requirements and has been producing ADA and Title 24 compliant signs since they opened their studio doors. The vision-impaired must navigate the same spaces everyone else has available to them: schools, businesses, arenas, libraries, theaters, and more. They need and deserve the same information on educational opportunities, directional indicators, and safety risks - and Braille signs are the key to this freedom. 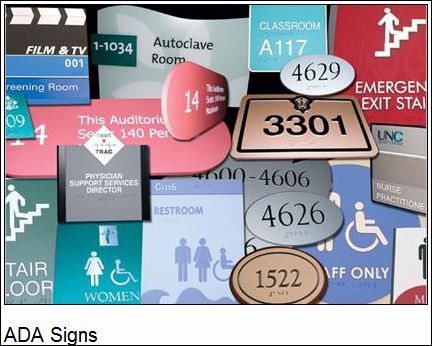 If you need further assistance on ADA Compliance or any other signage, please give us a call at (818) 843-9200 or send us an e-mail at Info@SignStudioLA.com. The ability to generate sales will make or break your business. However, before you can make those sales, you need to generate a consumer interest in your company's products or services. The way generate such an interest is with a solid marketing plan. While many elements of a marketing plan will change to match the zeitgeist, one will not: Your signage is a critical way to market to consumers in a quick, effective way. But why? This article will take a look at what makes a good sign so important for the success of your business. The problem with most outbound (ostensible) marketing solutions such as television advertisements and popup internet ads is that they get in the way. Commercials are commonly known as a blockade between viewers and their shows, and users want to view the content that led them to the website in the first place -- not the ad popup that block their ability to do so. A good sign, on the other hand, is a borderline inbound marketing (consumer-friendly) resource, since it brings them closer to your brand without being intrusive. A good sign will do one of two things (if not both): it will either direct consumers to the nearby location of your business, or it will provide them with instant access to communicate with your company. This feeling of fast access to your company will make a customer comfortable going to you. Most elements of your company's marketing plan, including the most successful ones, will require tweaks, updates and major changes to remain fresh, up to date and compatible with the latest technologies. Well-made signs, on the other hand, require none of this. Unless your company;s logo, colors, contact info or offerings change, there is no need to update your signs once they are erected. Also, since a physical sign requires no software updates or design language changes, you won't have to do anything in that regard either. The little maintenance that you will have to engage in mostly involves making sure your sign is clean. Sometimes a consumer is looking for a specific type of product or service, but they feel like it is too much of a "hassle" to find a company like yours; sometimes a customer will already have another company in mind for offerings like yours. If it is good enough, your sign can change the minds of these people. For instance, if a customer trying to avoid the hassle of searching for a business sees your sign, they could literally drop what they are doing and pay you a visit. Another great benefit of a good sign is that it will catch the attention of consumers without you having to do any extra work. This means that you are essentially enacting a 24/7 marketing tactic that works for you even while you are sleeping. Bottom line: A good sign will exponentially increase your company's number of sales leads. Not utilizing this tool would be a huge business blunder that you can't afford to make. The first step to obtaining a new business sign that will bring in more business opportunities is to find a good sign company. If you are looking for sign services, contact The Sign Studio. They are a team of business sign experts who can deliver the signage you need to grow your business. For further information please call (818) 843-9200 or send an e-mail to Info@SignStudioLA.com. If you’re looking for that perfect sign for your business, event or display, you have come to the right place. At the Sign Studio, you will get the expertise that you need and it arrives in three. Julie Ramirez, Bill Bates and Chris Ramirez are the three ready to assist you with their skills and knowledge in the field. The Art Director Bill Bates and Marketing Specialist Julie Ramirez combine their experience and abilities to form a team that makes your experience with The Sign Studio a pleasant and successful one. When you make first contact with The Sign Studio, you will touch base with Julie or Bill. The Sign Studio will assist clients by identifying their needs enabling them to develop cost effective products that fit their client’s budget and bring results. The Sign Studio will spend the time needed individually with each and every client so they can capture the personality of the business to deliver the best product possible. After the concept of the design is developed, the project is put in the very capable hands of owner Chris Ramirez. Chris is there for the production and installation of each project. The Sign Studio is ready to equip Event Shows with signs, Trade Show with signs as well as Trade Show Displays with signs. The Sign Studio truly is one stop shopping for all your signage needs. 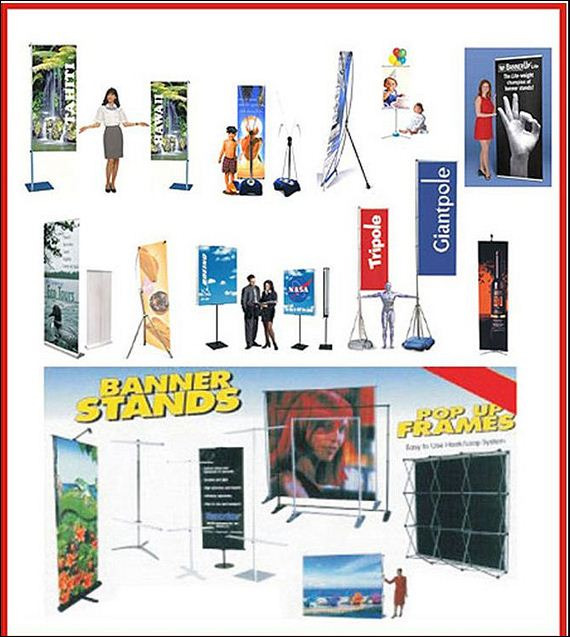 For a complete catalog of Trade Show Displays, please click here! Julie wants everyone to know that at The Sign Studio, they really like to get to know their clients. Before the whole project is complete, the client has become a friend. It makes for a more personal touch and a better end result for both the sign buyer and the bottom line for their business. The Sign Studio uses, the latest and most up to date hardware and software to create the best results. They do all of this while making the whole process simple and stress free. RTA – Ready to apply lettering and graphics. Don’t bust the budget; stay on track with a professional look and design. Location is everything; find the best location for maximum traffic to your booth. Keep the booth simple, light weight and durable. Color schemes, design, business image and logo that catch the eye are a must. Compile and convey bullet-point, easy to read product information. For more ideas on your upcoming trade show, please see our Exhibitor's Handbook. The Sign Studio is serving the Glendale, Pasadena, Burbank and greater Los Angeles area. The company has been doing business since October, 2004 and can't wait to talk with you about your next project. Please give us a call at (818) 843-9200 or send us an e-mail at Info@SignStudioLA.com. LA Sign Co | How Important and valuable signage is for your business! For any business to succeed, the most important thing is that potential customers know that they are there. In one way or another, this is done through advertising. There are several ways to advertise. You can produce a television or radio commercial, take out an ad in the newspaper, put in a listing in the newspaper, encourage existing customers to “tell their friends,” or you can put up a sign. Of all these methods, it turns out that putting up a sign is the most effective. Effective signs do three things. They inform potential clients about you business, direct them to take a closer look at what you have to offer, and contribute to the sales of your businesses products of services. At The Sign Studio, our staff can help you achieve all three of these objectives. The Sign Studio was first established in 2004 by Chris Ramirez who still owns the business today and personally oversees the production and installation of every sign. The other part of the equation is working with a regular team that is both trustworthy and very good at what they do. This is exactly what Chris Ramirez has found in his Marketing Specialist, Julie Ramirez and Bill Bates, The Sign Studio’s Art Director. Julie and Bill work closely with one another and with customers to help assure that they have just the right sign for their business. As Art Director, Bill applies his “awesome” design skills toward the creation of many different types of signs including window and vehicle graphics, menu boards, banners, yard and digital signs, Ready-To-Apply graphics and lettering that customers can apply to signs as they see fit, as well as signs that comply with ADA regulations. Julie takes Bill’s skill and creativity and brings it home to the client. By using sign making systems and techniques that are state of the art, Julie is able to keep the process of creating high impact signs that are not only cost effective for customers, but also drive in business. Both Julie and Bill work closely with clients and get to know them well in order to determine the best direction to go as each sign is produced. The Sign Studio serves the Greater Los Angeles area. To inquire about how our signs can improve your business, fill out our simple online form and get a quote today. For further information or inquiries, please call us at (818) 843-9200 or send us an e-mail at Info@SignStudioLA.com. The Sign Studio is a full service sign company. We provide everything from logos, banners, digital prints to electrical signs. Sign Contractor's for electrical signs, permits & planning. Sign repair & maintenance. Large format digital printing, banners, vehicle graphics and more!!! We specialize and carry all stock ADA Tactile/Braille Signs and make custom ADA sign also. We stock all parking and handicap signs and will have them ready for pick-up or ship out.